"Sponsorship is not about the pre-existence of defined rights or the exchange of cash; but the process of marketing through association. The emotional heart of sponsorship is value transference from one environment to another – regardless of whether this is via a self-created or an established property." Sponsorship works – now you have to prove it. To win a place on the shortlist, you need to show that your campaign made a measurable and targeted contribution to pre-defined business objectives. Return on investment must be evident – as specified in your objectives whether they be sales, brand engagement, brand building, employee involvement and retention, customer relations, etc. 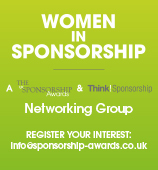 The Sponsorship Awards recognise and reward excellence and effectiveness across all sectors of the sponsorship industry. Entries are invited from in-house teams, from consultancies and from sponsored organisations/rights-holders. Size of organisation/budget is irrelevant – relevance, rationale, maximum use of all opportunities, creative thinking, outcomes and benefits to both parties are all important.